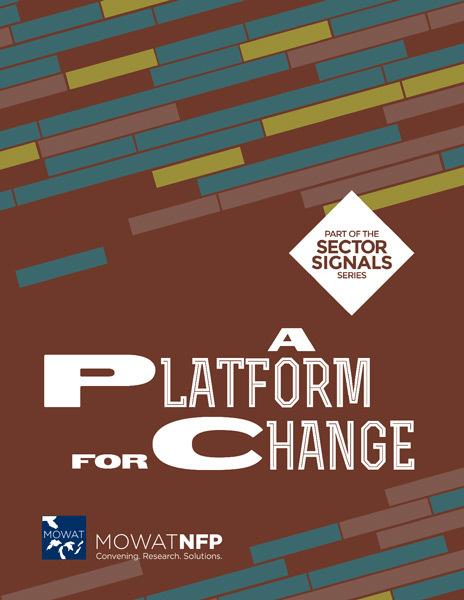 This Sector Signal explores shared platforms as an organizational model for the not-for-profit sector and considers the opportunity to expand and deepen the practice. Change makers, social entrepreneurs, artists and arts collaborations, and other groups looking to make a difference in their communities, have a limited menu of options to organize their work in order to secure funding and deliver on their vision. The “not-for-profit” corporation has been the lone organizational model that has driven the shape of community activity in Canada. There is a long history of charitable organizations finding options within existing regulatory guidelines to fund new projects and ideas. Providing organizational support to new ideas, creative enterprises, and community initiatives has sometimes been called trusteeship. More recently, this practice has evolved into something called shared platforms. In a trusteeship, an organization undertakes a stewardship role in response to the needs of its partners and the community, and also to the needs of funders to find ways to support new and innovative work. Shared platforms are organizations that have been established with the purpose of providing shared governance and organizational support to projects that are aligned with their mission. For the purposes of this report, the term “shared platform” will be used for simplicity. Shared platforms offer change makers an alternative organizational model to enable greater efficiency, flexibility and responsiveness. They are incorporated organizations made up of community-led and mission-aligned projects or initiatives. The shared platform provides a governance structure, financial and risk management, human resources, and a range of administrative supports to projects. These organizations offer a holistic approach that delivers on governance and accountability. They reduce administrative burden, enhance leadership and impact, develop capacity, and create space for innovation. However, as a model, the shared platform is a new concept and practice, and there is a learning curve for community innovators and funders alike. This Sector Signal looks at the emergence of shared platforms as an organizational option for the sector. It explores early learnings, and considers the path forward to expand and deepen this opportunity. The objective of this report is to highlight shared platforms as a model and to act as a catalyst for a more strategic conversation among funders, policy makers, practitioners and researchers about how to continue the evolution of this model of governance.